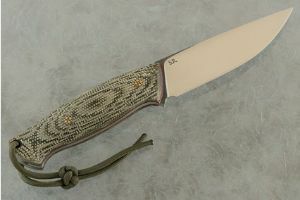 Description: Italian bladesmith Simone Raimondi began his journey into custom knives at the 2002 CIC show in Milan. By 2005 he had become a full time maker and in 2007 he received his master title (maestro della Corporazione) from the Corporazione Italiana Coltellinai). He is a voting member of the American Knifemakers Guild. He has received numerous awards for his work. Raimondi built this high performance hunter to perform well through hard, daily use, yet he put his full attention to detail throughout. 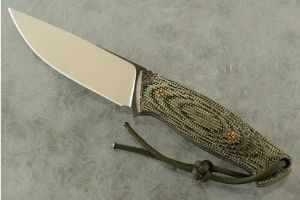 The drop point blade is meticulously hand satin finished. At 61 Hrc, the knife will hold a keen, long lasting edge. Green Micarta scales are set on a full tang for strength and durability. Burgundy spacers add just the right amount of accent. 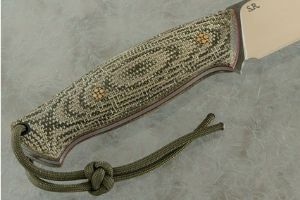 The handle is set in place with two mosaic pins and a lanyard tube. The handle is expertly contoured for a secure comfortable grip. 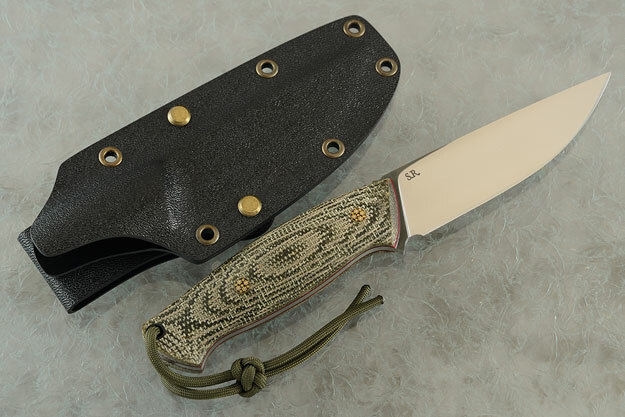 This is a knife you won't want to put down -- even after hours of hard use! 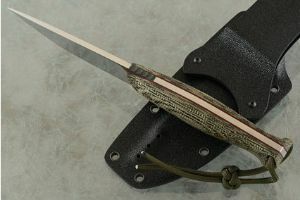 The knife is accompanied by a custom fit Kydex sheath.